I wish you a wonderful start in the weekend. I thought I drop by (my own blog!) and say hi *waves*. I was not around for two days. That was because I have 6 hours of teaching on Thursday and Friday and on Wednesday I don't teach but I have to prepare. Since this is my first year everything is more hectic and busy than it usually will be. I am patting myself on the shoulder for the fact that I survived the first week! I will open a champagne and try to answer the comments later on tonight. By the way you might have noticed that I have written a post on Tuesday which starts like "I hope you are having a wonderful weekend". Gosh, what was I thinking? When I opened the packaging I was taken by the design. 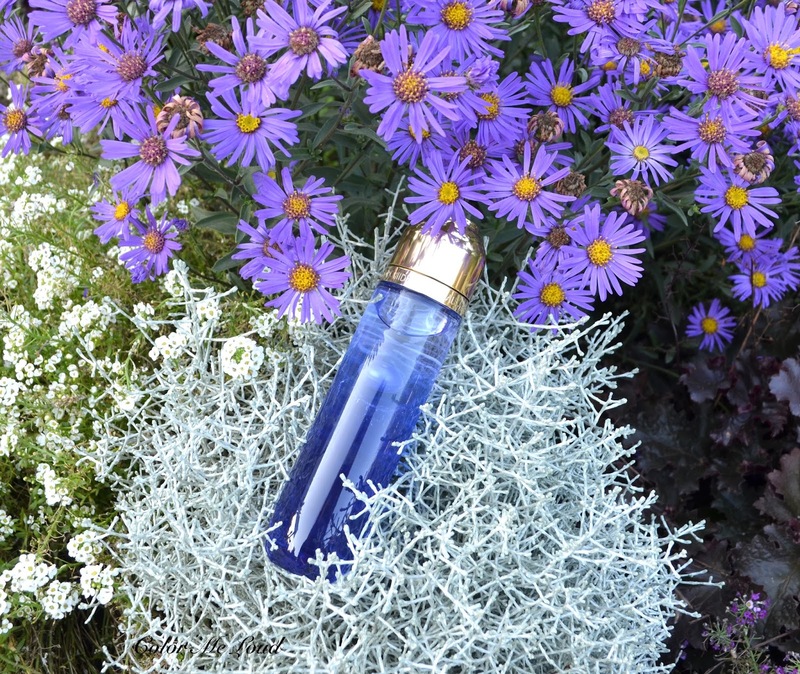 The glass bottle which gives the impression of an elixir feel luxurious and heavy although in no way bulky. It sits nicely in the hand or stands on your vanity desk as needed. The golden cap is of a sturdy plastic which is hold magnetically. To open it one can twist it a little in one direction and pull it. Although it is hold just magnetically, the closure feels very tight and safe. This must be my first skin care with magnetic closure if I am not mistaken and I really like it. The product can be dispensed by a tiny hole by shaking it a little back and forward. It is a one way system, without pump so no products will be wasted after the level is down. The amount of the product can be controlled nicely too. As I have now written, practically it is all good but from an esthetical point of view, this one is a real eye catcher. The purple liquid topped with the second transparent phase and a ball suspended between these two liquid forming bubbles as you shake. I can just sit and play with it. The ball is very pretty to look at but it is also functional. Because of the dual phase property of the product, one has to give it a good shake to get the best out of both phases during the application. Ball between the phases helps to mix them up better. The top phase consist of oils to make the other phase more effective. The bottom lila phase is the detoxifying phase filled with anti oxidants. It is recommended to apply Guerlain Orchidée Impériale The Night Detoxifying Essence after cleaning your face and applying a lotion for hydration. I distribute just a small amount after mixing both of the phases properly. During the application, product glides on very smoothly on my face. I believe it must be trimethicone high up on the list. That said it doesn't feel particularly silicony. I know that my skin loves glycerin, especially those in Guerlain skin care so this is no exception. That said those with sensitive skin may like to patch test since there is alcohol high on the list as well as fragrance. 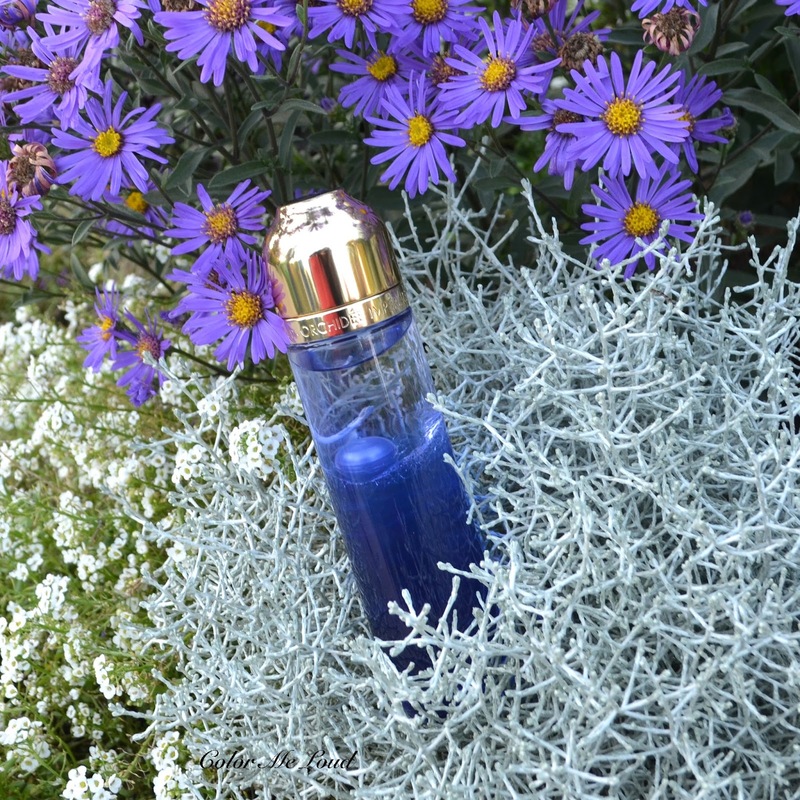 Orchid Extract is the signature of Guerlain Orchidée Impériale line. Together with oat kernel extract and mallow extract, orchid extract is known to be anti-oxidant, regenerative as well as having soothing effects. 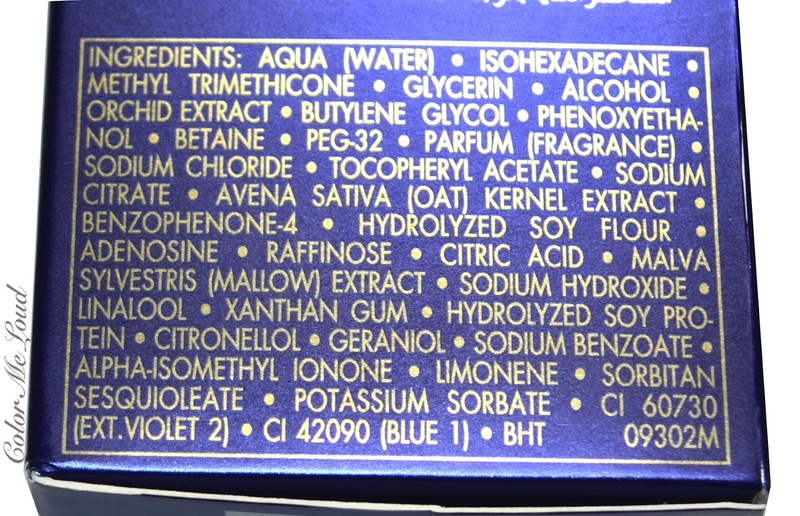 Full ingredients list is provided below. I am particularly picky at the moment when it comes to insert a new "step" to my evening routine which consists of cleansing, hydrating, whitening and anti-oxidents. Guerlain Orchidée Impériale The Night Detoxifying Essence is perfect between the hydration and my night cream. Those nights when I use it, I skip the facial oil because I feel like this essence gives a similar effect on my skin. All in all I am really impressed with how a small amount of the Essence makes my skin glow and look fresh in the morning. This one looks like another expensive addiction for me. 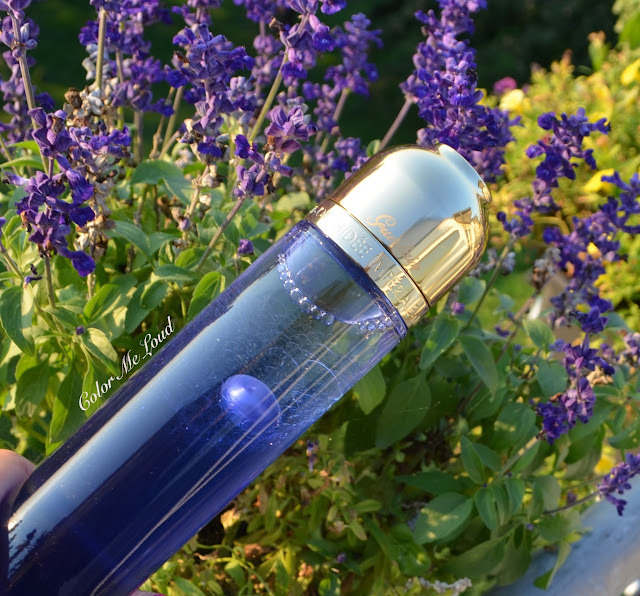 Final thoughts: Guerlain Orchidée Impériale The Night Detoxifying Essence is not only a pretty phase (pun!) but it gives a baby soft skin at night after the application. After being absorbed quickly, the softness remains. In the morning my skin looks refreshed and radiant. Although the price point is high, there is a generous 125 ml of product and the bottle design alone is worth an investment to place on your vanity. 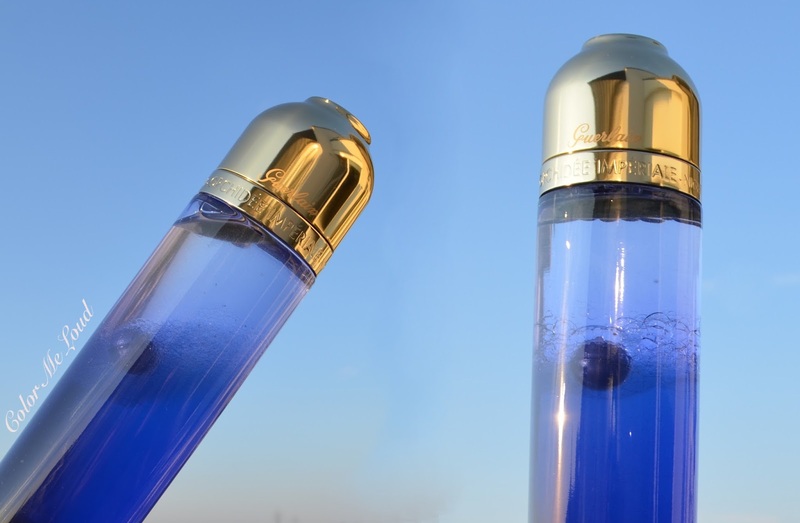 Guerlain Orchidée Impériale series goes on to impress. Availability/Price: Guerlain Orchidée Impériale The Night Detoxifying Essence costs around 197€ in Germany and available starting from 20th October. I see that Selfridges already have it for £145. What is the most luxury skin care product you own to date? Disclosure: The product in this post were provided free of charge for my consideration. It looks absolutely wonderful in the bottle but with alcohol so high in the ingredients list, this is not a product I could use. I have to say that for the price, I find the ingredients list a little... unimpressive. Love the purple color -- and I don't use skin care products that have alcohol. Glad you survived the first week, and are still able to be punny LOL! This product sounds divine, but I also worry about the alcohol and fragrance. I think my most luxury products are La Mer the Moisturising Soft Cream and Sisleya Global Anti-ageing cream. LOL Bella, yes I became so punny ;-) It might be the side effect of teaching. Sometimes students answer my questions in such funny ways, I remain inspired lol. Sisleya Global Anti-aging cream is in my wish list, I also heard great things about La Mer Moisturizing one. I understand, there is research results which are worrying. I usually don't care if alcohol is lower down on the list but this one worried me too. I am planning to place this one on a led lighting in the living room as decoration. In person it is even more gorgeous, a true work of art. I wished there wouldn't be alcohol in there. I am fine with the fragrance though because it smells so divine. I know what you mean. 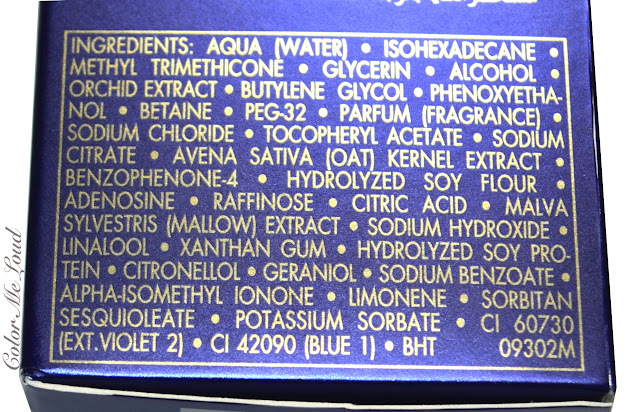 The rest of the list is very impressive though, with very hard to find anti oxidants and anti-aging ingredients. I just wished alcohol wouldn't be so high.